Virgil Wander is a phenomenal book. I adored Enger’s Peace Like a River and thus approached Virgil Wander with some trepidation. Could it be as good as Peace or even as good as his fine second novel So Brave Young and Handsome? The answer, my friends, is that it’s much like a third child. It’s as different an animal as heredity and environment (and the same writer’s pen) will allow, yet that child is every bit as cherished as were its siblings. 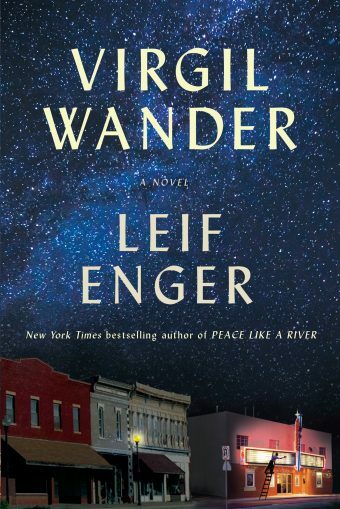 Virgil Wander is an entirely different novel than Peace was yet both tell a captivating story and feature engaging characters that linger with the reader long after the last page is turned. Virgil lives in an apartment above the Empress Theater which he owns and operates on an occasional basis. He’s also the town clerk, a part-time job that helps pay the bills. Virgil is primarily a wanderer as his name implies and he leads his readers and his neighbors on a ride as ordinary as running a film reel and as wild as riding the back of a sturgeon. On the day of Virgil’s release from the hospital, Rune, a Norwegian stranger, enters the “bad luck town of Greenstone, Minnesota” where he meets Virgil at the waterfront. Rune arrives in Greenstone in search of the son he’s only recently learned he’d fathered. Said son had been a minor league pitcher who’d once pitched a perfect game, attracted interest from the majors despite his Mark Fidrych-like inconsistencies, married, had a son, and then vanished in his flimsy plane over Lake Superior. Eccentric Rune makes and flies kites. They’re kites that most adjectives, even the ones Virgil's recovered, can’t begin to describe. Rune’s kites allow him to get to know the townspeople and his grandson as they fly them together beyond reality. Through Rune’s eyes, the reader sees the town and its residents uniquely. With a touch of Enger’s signature magical realism and plot details that conjure the mysterious, Virgil Wander is much more than a quirky character-driven ode to the Northland. It’s also a siren song of the need to find a place where you matter and to push the envelope when that place starts to disintegrate. The seductive appeal of the minor characters never distracts from the story thus allowing the reader to fall under mythical Greenstone’s spell. Summing it Up: Read Virgil Wander to enter the magical realm of a quirky, middle-aged man who’s rebirth after an accident offers the reader a view into a northern landscape where ordinary people act in mysterious ways.